-Dramatic Display: Numerical escalation plus mythic power expenditure for nat 20’d maneuver checks in the round after the display. I don’t like nat 20-granting abilities particularly for a reason and this falls into the category – the secondary benefit is arguably better than some primary benefits for combat maneuver enhancement as it also provides a +4 bonus in addition. This one is pretty broken in my book. -Whip Mastery: Numerical escalation, but also mythic power expenditure for a follow-up attack versus a foe just tripped or disarmed. -Improved Whip Mastery: Threaten the area of your reach. Also: Move unattended objects with the whip and move medium and smaller foes you tripped. Cool! -Greater Whip Mastery: Grappling of adjacent foes via whip, option to tie them up and also Chokehold them. Nice! -Hero’s Display: Present Weapon Focus’d weapon for AoE demoralize, with subsequent attacks with the weapon further extending the duration of the effect. Okay, I guess. -Masterful Display: Select 2 mythic performance or 3 regular performance feats; when making the performance combat check, you gain access to them, but only a +2 to the combat performance check. -Mocking Dance: Move 5 ft. sans AoO or full movement with AoO, but you can’t end the movement in a square that threatens an enemy; Adds bonus to combat performance and allows for AoE demoralize and it makes it possible for Diplomacy or Intimidate to be used to Antagonize instead. I wished this feat had a more precise wording than its non-mythic base, which failed to specify whether the 5-foot movement counted as a 5-foot-step or not. On a design-aesthetic position, I also would have included Antagonize among the prereqs. Finally, while this is a nitpick, I’m not 100% clear whether the skill-substitution for Antagonize only works in conjunction with Mocking Dance, but I assume no. -Murderer’s Circle: Numerical escalation for the granted movement by critical hits and maneuvers, with mythic power allowing for a follow up attack at bonus – nasty, but cool! -Performance Weapon Mastery: Numerical escalation of the base feat. Okay. -Performing Combatant: Makes all your performance feats available (instead of just one) at DC 20 and spend mythic power to make it count as natural 20. Much like in the base feat, I wished this actually provided full-blown synergy with hypothetical/imagined crowds – think about it: A mythic character “performing” for a crowd of ancestor spirits? That would be pretty awesome. A solid feat, but also a wasted opportunity. 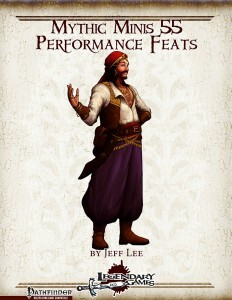 Jeff Lee’s performance feats are generally okay, though not always perfect. Over all, they do a solid job at what they set out to do, but also fall a bit flat of a conceptually awesome update – you receive solid craftsmanship with some minor hiccups and missed opportunities here. I will hence settle on a final verdict of 3.5 stars, rounded up to 4 due to in dubio pro reo. You can get this nice mythic mini here on OBS and here on d20pfsrd.com’s shop!